Posted on January 31, 2019 by gayle. 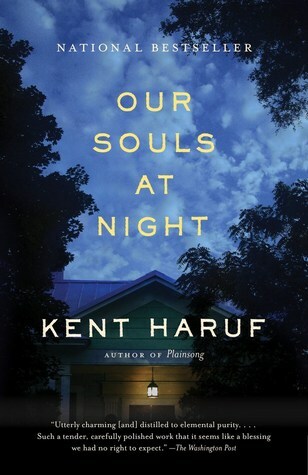 This entry was posted in Fiction and tagged colorado, kent haruf, our souls at night. Bookmark the permalink. Thanks! I am glad you read my review! I read this quite a while ago and had no idea that Haruf wrote this while he was dying. That makes me want to reread it because I wasn’t happy with the book. I looked for excuses to put it down. I was angry with the author for writing such ridiculousness: Addie’s and Louis’s adult children reprimanding them, both in their 70s, for wanting to be together at night. RIDICULOUS! To make matters worse, Haruf used punctuation marks sparingly and quotation marks not at all. I think of that as regressing to the time before people thought readability was important enough to invent those marks. It does seem ridiculous, but perhaps because they were in a small town and her son had leverage (time with the grandson) she felt she had no choice. I enjoyed all of Haruf’s books. I understand books cannot always end the way you want them to, but it really bothers me the way that Haruf chose to go. This book would make a good movie. It WAS made into a movie! Jane Fonda and Robert Redford. I think it came out a few years ago. Loved this gentle, but deep, novel. I didn’t mind the lack of quotation marks at all — I thought it added to the book’s appeal. I feel like it will stay with me for a long time. Very satisfying, albeit sad. I loved how Addie and Louis settled into such a comfortable relationship, despite, perhaps, its ill-defined nature. Me too. Loved this book. I’m so glad you loved this! Haruf’s writing is some of the deepest, purest I’ve ever read. I heard you mention on the podcast that you were going to try the Plainsong trilogy at some point. I don’t think you’ll be disappointed. I loved two of the books even more than Our Souls. I remember you saying that about the trilogy.I am definitely going to read the other books. I LOVED Our Souls At Night.